Who: Schifter+Partners handbag sample sale featuring L.A.M.B., Jill Stuart, Harajuku Lovers, and Kidrobot! Harajuku Lovers and Kidrobot lines? Why: It's what we have been waiting for all season! So come and indulge your handbag fetish! - Signature Collection, Cambridge Satchel in pebble grain coated canvas. 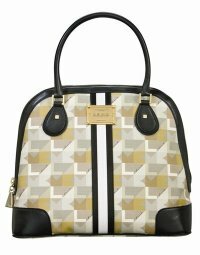 - Signature Collection, Moneague Tote in pebble grain coated canvas. - Darjeeling Leather Collection, Orissa Clutch Wallet in shiny smooth cowhide leather. - Darjeeling Henna Collection, Jaipur Tote in printed cotton canvas with smooth cowhide trim. - Poppin school bag in printed nylon twill with jacquard web. jacquard webbing and metal logo hardware. Comes with a collectible Kidrobot toy. Originally $98, at sale $30.